Well, it’s over. The Tater is at school and all is well. Yesterday was the 1st day, so we parked, got out of the car, walked to the room, did all the picture-taking stuff. You can SOOO tell which parents have kindergarten kids ~ there’s more cameras than on the red carpet…..Oh, let’s take a picture of her walking down the sidewalk. OH, let’s take a picture of her sitting in her seat. OHOHOH, let’s take a picture of her at the door to her room. Oh, I KNOW! Let’s take a picture of her putting her backpack in the closet. Geez….and yes ~ I am guilty of Every.One.Of.Those! God Bless her teacher, she said “Take all the pictures you want to take, this only happens once.” Then she turned back and said, “Well, it’s only SUPPOSED to happen once.” Lemme tell ya…this is only happening once! 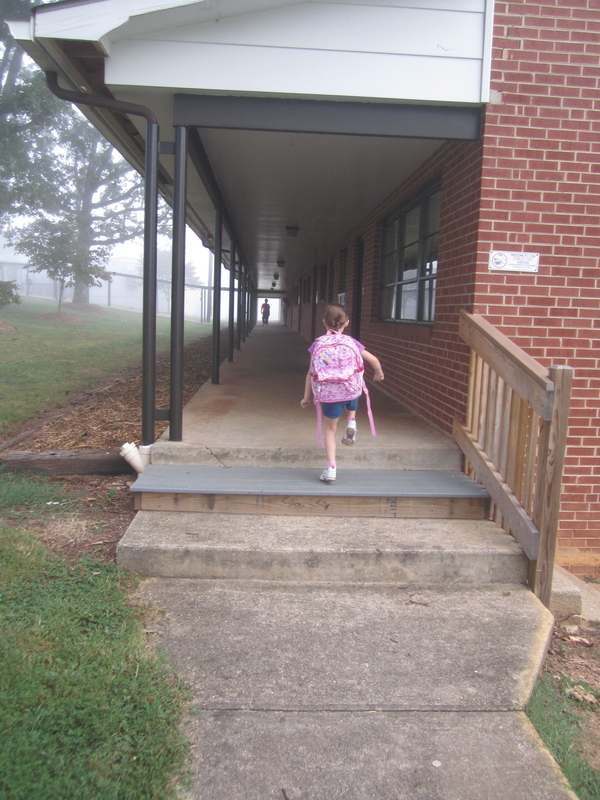 So, this morning we have the pep talk about dropping her off at the sidewalk, a teacher opening the door to the car, she’ll hop out without a fuss, fit, or flailing arms. She’ll walk to her room like a big girl and then she’ll have a GREAT DAY!! A GREAT DAY!! A GREAT DAY!!!! I decided the only logical thing to do was call the school and make sure she got to her room. The secretary chuckled as she put me on hold and then came back on the line to tell me she was in her room, happily playing. Whew. I called Mac and when he answered, I said, “Well, that sure was difficult!” and proceeded to tell him the story. I don’t think he’s funny at all. Not one bit. Nope, not at all. I’m thinking she should ride the bus to school next week…..that way I’ll be able to SEE her get on the bus. And I’m not gonna think about what happens when she gets off the bus and has to get to her room. Nope, not gonna think about it at all. Not one bit….. Previous If I only knew then what I know now…. I get this post. I so get this post. My boy is heading off to high school next fall. Many high schools here begin in 8th grade. (It’s a stupid New Orleans thing.) And I’m not sure I’ll even be able to bring him as he will be MORTIFIED by the deafening, hysterical bawling of his mother. Be glad your little person is so well adjusted. And have a yummy snack that takes a long time to eat for her when she gets home every afternoon so you can sit down together and recount her little day. I STILL drive around, sit behind some parked car (almost in the road) and watch her walk down the LOOOONNNGGGGG sidewalk to her room and open the door….just to make sure 🙂 So not looking forward to the teen years-ha! THANKS! That is fabulous ~ and I’ll be right there! Yes, that drop off was much tougher than I imagined it will be…better start preparing for it now! As a former schoolteacher, you brought back some funny memories of first days-and just between you and me- glad you made a good first impression on the secretary- she is the one in power and don’t you forget it!! You definitely want to remember her throughout the year on all those “Teacher Appreciation Days” because she is not at the bottom of the food chain- rather she is right up at the top…The secretary can get things done when no one else at the schoolhouse can! I am still laughing imagining Sasha riding around the school buidling unsure if Tater made it to her room or not! Oh, thank you for those encouraging words! And I’ll definitely remember the secretary, because I can see her as my go-to girl LOTS of times! Thanks! Yes, I think it will….I was just so amazed that she got out of the car, no problem and went right to her room…just like I’VE BEEN TRAINING HER TO DO FOR WEEKS! Ha, guess it worked! Thanks! My ‘baby’ turns 18 today. He still can’t get himself up and out the door!